Flamingos seem to be everywhere these days, and they always bring a smile to my face. How can a giant pink bird not make you happy? We’re in the heat of Summer here, and I wanted to use some cool, pretty colors. 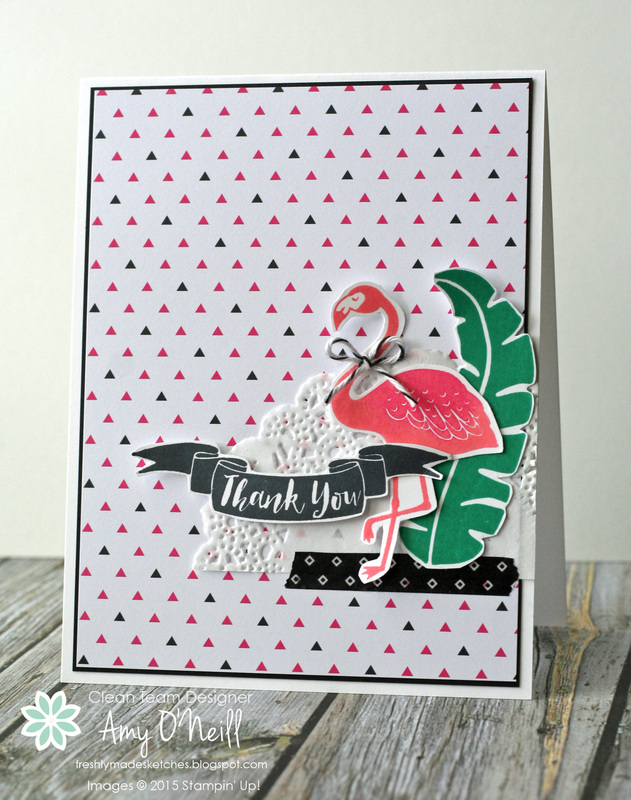 It seemed like they would work well with a tropical flamingo look, so this was an easy card to pull together. I started by adding a watercolor wash of Pool Party ink on a piece of Watercolor Paper. After that dried, I splattered on some gold Wink of Stella and some Basic Black ink. 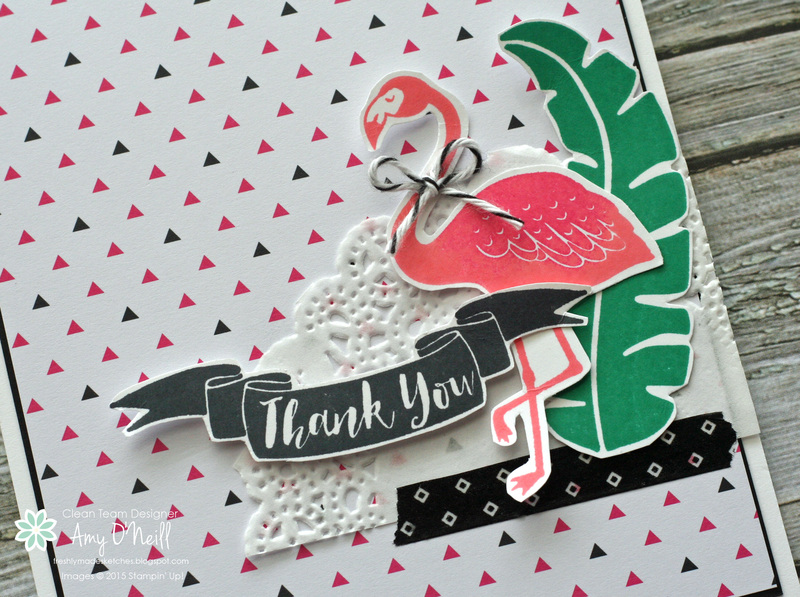 I stamped the flamingo with Flirty Flamingo ink, added a little Melon Mambo ink onto the wing with a blender pen, and colored its beak with a bit of black ink. 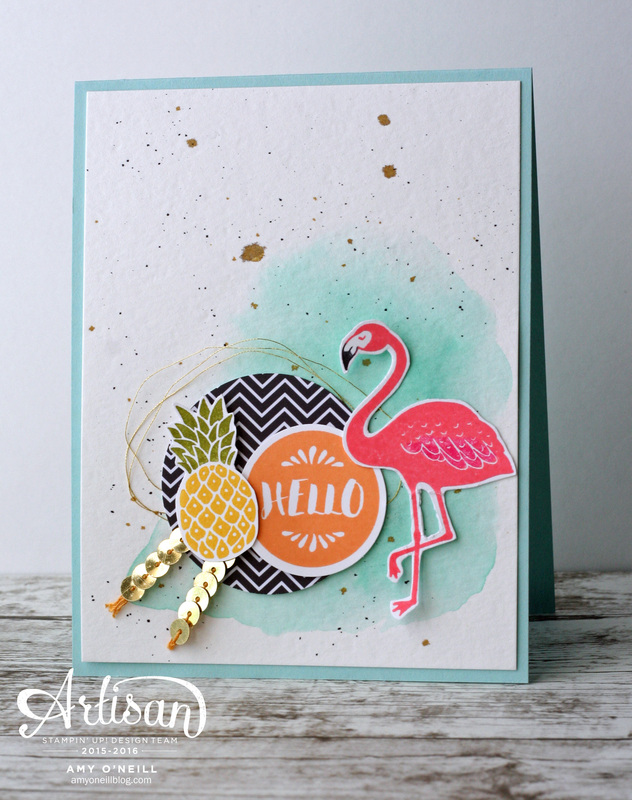 The sentiment was stamped with Peekaboo Peach ink, and the pineapple was stamped with Daffodil Delight and Old Olive inks. I punched out a circle of Pop of Pink Specialty dsp and placed it over some gold Metallic Thread. This sketch is right up my alley! I’ll call it “clean collage style.” I have a new stamp set, Pop of Paradise, that will be available next week when the new catalog goes live, and I have been itching to ink it up. I’ve paired it here with a piece of Pop of Pink Specialty DSP. 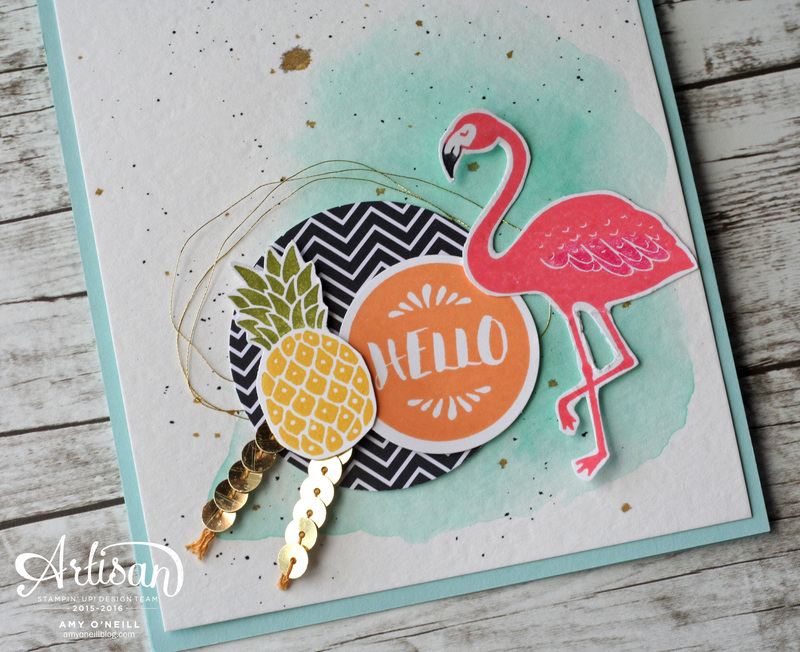 I stamped the flamingo with Flirty Flamingo ink (what better color could there be for a flamingo stamp, right?) and sponged on a little Melon Mambo ink on the wing area. The leaf was stamped with Emerald Envy ink. I used a little strip of Pop of Pink Designer Washi Tape to help hold the doily down and to give the flamingo something on which to stand. We hope you’ll play along and make your own card using the sketch and post it in the gallery. We love to see what you make! Meanwhile, be sure to hop on over to the Freshly Made Sketches site for some inspiration and to see what the design team made.